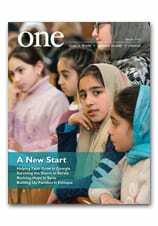 In the latest edition of ONE, writer Diane Handal reports on the exceptional work undertaken by three groups of religious sisters in the Holy Land. Below, she describes how her journey began, as she arrived in Israel. I arrived at Ben Gurion Airport from Istanbul, awaiting the last leg of the trip: Tel Aviv to Jerusalem’s Old City. The blue-and-white flag of Israel with the Star of David was everywhere as I walked toward passport control. I took the shuttle bus down to Jerusalem with half a dozen other travelers. We drove by the green rolling hills of Ma’ale Adumim, about four miles from Jerusalem, an urban Israeli settlement and city in the West Bank. In 2015, the population was close to 38,000. A religious sister from the Ukraine in a white habit with a red cross embroidered on her veil sat across from me and a young man from Vancouver sat beside me; it was his first visit to the Holy Land. The three of us departed at the Jaffa Gate only to find we were at the bottom of the huge wall and had to climb up to the actual gate with our baggage. I asked the driver why he left us below and his reply was that it would cost 50 more shekels (about $14) to be taken to the gate. The ride from the airport was $20. I wanted to scream. The sister helped me carry my two bags and a stranger grabbed her bags and we trekked up together. This was her second trip to the Holy Land and she said she was with the Russian church, which I believe was the Church of St. Alexander Nevsky. Jaffa Gate was bustling with tourists and families who came to hear a classical music concert next to a huge Menorah with bright blue lights. I dragged my bags to my hotel on one of the narrow winding stone streets of the Old City, and later went in search of a new shawarma place in the Christian Quarter, said to be better than my favorite in Bethlehem, Abu Ali. I walked for a half hour through the narrow stone passages with their uneven steps that were slippery from the pouring rain. Merchants on both sides were standing in front of their stalls of pottery, religious artifacts, embroidered Palestinian dresses, jewelry, spices, fresh orange and pomegranate juice; some were using a broom to sweep the water back. Every shopkeeper I asked sent me in a different direction. But eventually, I did find Maria’s and was greeted with “Ahlan wa Sahlan,” (Welcome) by Jack, the owner. He named the restaurant after his daughter Maria whom he had lost. A young German couple from Berlin was sitting at a table. They had just come from Tel Aviv and were surprised by the high prices, even the hostels. They loved Jack’s shawarma, as did I. The following day, I went to Bethlehem. It was cold, raining, and very windy. The sky was a steel gray, matching the wall that surrounds the city, only brightened by colorful graffiti. International graffiti artists include the anonymous Bansky, also a political activist and film director. His street art and subversive sayings combine dark humor with graffiti using a unique stenciling technique. For Israelis, this is a security wall, which they claim protects them from Palestinian attackers trying to enter Israel.? ?For Palestinians, this is the reality: a concrete wall, stretching over 430 miles, a 25-foot high cement barrier representing what they see as apartheid. I visited the Crèche (Holy Family Children’s Home) in Bethlehem, the only orphanage in the West Bank run by the Daughters of Charity. When I walked into the nursery, about a dozen cribs lined the wall with colorful mobiles over each. My heart sank. Most of the babies were sleeping; a few were whimpering. At the far right corner were two babies tucked under pink blankets who were 10 days old. Their mother had been sexually abused by male relatives and was in hiding for fear of being killed for ”dishonoring” her family. In the middle of the cribs was a little baby girl whose mother was 14 years old; the mother had also been sexually abused by a family member. At the far left, a little baby named Nadia was lying on her stomach. She had brown hair and her big brown eyes darted back and forth. She had been left on the street by her mother. My heart ached for these innocent babies, thinking of what lies ahead for each of them in this very conservative Middle Eastern culture where adoption is forbidden under Islamic law. On the way to the checkpoint, I stopped at the Bansky Museum inside “The Walled Off Hotel,” which he owns. And then, it was on to the checkpoint and young heavily-armed Israeli soldiers checking papers and passports and, asking many questions. Read more about sisters Seeing the Face of Jesus in the March 2019 edition of ONE. Even if Christians struggle to recognize him with his “torn clothes (and) dirty feet,” Jesus is present in the migrants and refugees who seek safety and a dignified life in a new land, Pope Francis said. Pope Francis spoke about overcoming fear and welcoming others during a Mass he celebrated 15 February at a church-run retreat and conference center in Sacrofano, about 15 miles north of Rome. The Mass was part of a conference titled, “Welcoming Communities: Free of Fear,” which was sponsored by the Italian bishops’ office for migration, Caritas Italy and Jesuit Refugee Service’s Centro Astalli. The 500 participants included representatives of parishes, religious orders and Catholic-run agencies assisting migrants and refugees, as well as individual families who host newcomers. At a time when Italy’s government is trying to severely restrict immigration, Caritas Italy said the meeting was designed to encourage those working with migrants and refugees and to counteract fear of migration by highlighting how individuals and the entire country benefit from welcoming them. The prayers of the faithful, most of which were read by migrants, included asking God to help pastors educate all Catholics to welcome migrants and refugees and to help government leaders promote tolerance and peace. Ending, as is traditional, with a prayer for the dead, the petitions made special mention of people who were killed for their faith. In his homily, Pope Francis noted how the ancient Israelites had to overcome their fear of crossing the Red Sea and trust God in order to make it to the promised land. And, when the disciples were on the lake in a storm, Jesus told them to not be afraid and assured them he was there with them. “The Lord speaks to us today and asks us to allow him to free us of our fear,” the pope said. Of course, the pope said, people naturally are afraid of what they don’t understand and of strangers who speak another language and have another culture. The Christian response is not to play on those fears, but to educate people and help them turn strangers into friends. This week, CNEWA’s president, Msgr. John E. Kozar, received a letter from a longtime friend and partner in the Middle East, Samir Nassar, the Maronite Archbishop of Damascus, Syria. IS SYRIA A FORGOTTEN LAND? It is often said that the Syrian war is the worst and most cruel seen by the world since the Second World War. 600,000 dead with only some buried in dignity and many others in collective graves. All this has meant that many families live in perpetual sorrow and emotional instability. 200,000 have disappeared, including two bishops and four priests; this has made life a nightmare for those who grieve for their loved ones — parents, friends and the churches who have no news of them. 13,000,000 refugees — a very heavy burden as a consequence of this world war game on the Syrian territory…whole populations who suffer in silence and despair. Bitterness and a loss of meaning to life…a broken people, scattered and searching for a future. 95,000 hands cut off, feet amputated or paralyzed in a country which is ill-prepared to handle these sorts of problems alone, and the subsequent psychological and health consequences. 2,500,000 dwellings demolished or destroyed. Local currency is valueless and inflation has risen alarmingly; the exodus of the young has marked the remaining hopes for future growth. Faced with these scenes of desolation in the church in Syria, I cannot fall into the role of a mere spectator. The church is a strong witness of the Spirit and the Light which it brings. She is a sign of the Presence and a witness in the domain of health care, education, pastoral work with the young, family support, accompanying fragile families and supporting in every way the less fortunate. All of this is done in the spirit of forgiveness and reconciliation. If the world has forgotten Syria, the Lord is watching over her and will not let the boat flounder! Thank you, dear Msgr. Kozar, for the mission of CNEWA in Syria. Our problems are too heavy. Please pray for us. We prepare for Christmas with a heavy Calvary. God bless you for all that you did and do. Please do not let Syria become a "forgotten land." Their needs are great. Remember them in your prayers. U.S. Cardinal Edwin F. O'Brien, grand master of the Knights of the Holy Sepulchre, and Cardinal Leonardo Sandri, prefect of the Congregation for Eastern Churches, arrive for a press conference at the Vatican on 7 November. The Knights are preparing for a major meeting in Rome. Every five years, leaders of the order from around the world gather for their general assembly, called a “consulta.” The meeting was scheduled for 13-16 November in Rome and was expected to include an audience with Pope Francis. Meeting with reporters on 7 November, Cardinal O’Brien said the knights and dames “do not become involved in local government or political questions” in the Holy Land but offer support to the local Catholic Church there in cooperation with the Congregation for Eastern Churches. Cardinal O’Brien said the order provides about $15 million each year in grants to Catholic projects in the Holy Land. Most are run by the Latin patriarchate, but the Maronite and Melkite Catholic churches also receive assistance. Cardinal O’Brien said each member of the equestrian order pledges to make a pilgrimage to the Holy Land at least once in his or her lifetime, but most go regularly. The pilgrimage is built around prayer and visits to the holy sites, but always includes visits to schools, clinics, parishes and other projects funded by the knights and dames. Paul VI meets with leaders of the CNEWA/Pontifical Mission family at the Vatican, including Cardinal Francis Spellman, chair of CNEWA, and Archbishop Joseph Ryan, then-president of CNEWA. On Sunday, 14 October, Pope Francis canonized seven saints — including Pope Paul VI, who was the bishop of Rome from 1963 until his death in 1978. The man who is now St. Paul VI was long a champion of our work around the world — beginning in the 1940’s. During World War II, then-Msgr. Giovanni Batttista Montini, who served Pope Pius XII, organized and directed the Holy See’s relief efforts for refugees. At a November 1948 meeting in the Vatican — during which the idea of a papal mission specifically for displaced persons in Palestine was discussed — it was Msgr. Montini who penciled in the name of the head of CNEWA, then Msgr. Thomas J. McMahon, to lead such an effort. Thus was born the Pontifical Mission for Palestine, which Pius XII entrusted to CNEWA as its operating agency in the Middle East. Fired with the Gospel message of hope, the pope met with heads of state and religious leaders in the Holy Land. These visits culminated with his embrace in Jerusalem of Orthodoxy’s spiritual leader, Patriarch Athenagoras I, Ecumenical Patriarch of Constantinople. Before departing the Holy Land, Pope Paul VI assured [CNEWA’s Secretary and President of the Pontifical Mission] Msgr. Joseph Ryan, who accompanied the pontiff, of the Holy See’s commitment to the refugees and encouraged Ryan to further the Pontifical Mission’s efforts with Palestinians. Paul VI’s pilgrimage resulted in social rehabilitation and development projects that, with support from the Pontifical Mission, changed the lives of many: Bethlehem University; Ephpheta Institute for hearing-impaired children; Tantur Ecumenical Institute; and Notre Dame of Jerusalem Pilgrimage Center. These diverse initiatives testified to the pope’s belief in the church as an instrument of reconciliation and hope. At the Mount of Olives, Pope Paul VI and Athenagoras I lift the mutual excommunications dividing the Catholic and Orthodox churches, in January 1964. The church regards with esteem also the Muslims. They adore the one God, living and subsisting in himself; merciful and all-powerful, the creator of heaven and earth, who has spoken to men; they take pains to submit wholeheartedly to even his inscrutable decrees, just as Abraham, with whom the faith of Islam takes pleasure in linking itself, submitted to God. Though they do not acknowledge Jesus as God, they revere him as a prophet. They also honor Mary, his virgin Mother; at times they even call on her with devotion. In addition, they await the day of judgment when God will render their deserts to all those who have been raised up from the dead. Finally, they value the moral life and worship God especially through prayer, almsgiving and fasting. We remain deeply grateful for the love and passion he brought to his papacy — and which he shared so selflessly with the suffering peoples in the Holy Land, a place now so fraught with division, hardship and violence. So many of those we serve need his prayerful intercession now, more than ever. Pope Paul VI prays at the River Jordan during his pilgrimage to the Holy Land in 1964. With humble gratitude and boundless hope, we join our voices to so many others around the world this day to pray for his accompaniment, his prophetic vision, and his courage. May his spirit help us to help others, and may his prayers guide us on our way. There has been a war in Syria since 2011, and half the country has been displaced, meaning families are no longer living in their hometowns, cities or villages. Thousands are victims of the war and are in dire need of help. For the past three years, Holy Family in Lawton has made it their mission to help those war-stricken families by giving Lenten offerings to the Catholic Near East Welfare Association (CNEWA). “Every Lent, we have a special Lenten Project. The past three years it has been Syrian refugees, the Dominican Sisters of Iraq, and refugees,” said the Rev. Phil Seeton, pastor of Holy Family. Father Phil expressed the need to do more. Luscia Hankins is the co-chairman of Holy Family’s Spiritual Life Committee, along with Mary Beth Mullins. The committee helps organize the Lenten fundraiser for CNEWA. In 2017, they raised $6,200. “This year, we raised $10,200. It was for the displaced Syrians who were placed in camps. The donation was to build camps of their own. They are being persecuted for the religion we share. It is an obligation to our fellow Christians,” Hankins said. Since 2013, they have given $38,000 to CNEWA. We remain deeply grateful to Father Phil and the people of Holy Family for their generous and prayerful support, helping so many of our brothers and sisters in need. Thank you!